William Laws Calley Jr. (born June 8, 1943) is a former United States Army officer convicted by court-martial of murdering 22 unarmed South Vietnamese civilians in the My Lai Massacre on March 16, 1968, during the Vietnam War. While not technically exonerated, after three and a half years of house arrest, Calley was released pursuant to a ruling by federal judge J. Robert Elliott who found that Calley's trial had been prejudiced by pre-trial publicity, denial of subpoenas of certain defense witnesses, refusal of the United States House of Representatives to release testimony taken in executive session of its My Lai investigation, and inadequate notice of the charges. His initial conviction faced widespread public opposition both due to the campaign circumstances of civilian embedded Viet Cong, and due to Calley being singled out as the sole officer convicted with respect to the massacre. Calley was born in Miami, Florida. His father, also William Laws Calley, was a United States Navy veteran of World War II. Calley Jr. graduated from Miami Edison High School in Miami and then attended Palm Beach Junior College in 1963. He dropped out in 1964 after receiving unsatisfactory grades, consisting of one C, two Ds, and four Fs. Calley then worked at a variety of jobs before enlistment, including as a bellhop, dishwasher, salesman, insurance appraiser, and train conductor. Calley underwent eight weeks of basic combat training at Fort Bliss, Texas, followed by eight weeks of advanced individual training as a company clerk at Fort Lewis, Washington. Having scored high enough on his Armed Forces Qualification tests, he applied for and was accepted into Officer Candidate School (OCS). He then began 26 weeks of junior officer training at Fort Benning in mid-March 1967. Upon graduating from OCS Class No. 51 on September 7, 1967, he was commissioned a second lieutenant of infantry. He was assigned to 1st Platoon, Company C, 1st Battalion, 20th Infantry Regiment, 11th Infantry Brigade, and began training at Schofield Barracks, Hawaii, in preparation for deployment to South Vietnam. Calley's evaluations described him as average as an officer. Later, as the My Lai investigation progressed, a more negative picture emerged. Men in his platoon reported to army investigators that Calley lacked common sense and could not read a map or compass properly. A number of men assigned under Calley claimed he was so disliked that they discussed fragging him. In May/June 1969 near Chu Lai Base Area, Calley and 2 other Americal Division officers were in a jeep that passed a jeep containing 5 Marines. The army jeep pulled the Marines over and one army officer told the Marines "You soldiers better square away!" One of the Marines replied, "We ain't soldiers, m***********, we're Marines!" The Army lieutenants dismounted for further discussion of the matter. The ensuing fight ended only after one of the officers pulled his pistol and fired a round into the air. Two of the officers were briefly hospitalized while Calley was merely beaten up. The Marines pleaded guilty at special courts-martial, in each of which it was stipulated they had not known the soldiers had been officers. The events in My Lai were initially covered up by the U.S. Army. In April 1969, nearly 13 months after the massacre, Ron Ridenhour, a GI who had been with the 11th Brigade, wrote letters to the President, Chairman of the Joint Chiefs of Staff, the Secretary of Defense and 30 members of Congress. In these letters Ridenhour described some of the atrocities by the soldiers at My Lai that he had been told about. Calley was charged on September 5, 1969, with six specifications of premeditated murder for the deaths of 109 South Vietnamese civilians near the village of Sơn Mỹ, at a hamlet called My Lai, simply referred to as "My Lai" in the U.S. press. As many as 500 villagers—mostly women, children, infants, and the elderly—had been systematically killed by American soldiers during a bloody rampage on March 16, 1968. Upon conviction, Calley could have faced the death penalty. On November 12, 1969, investigative reporters Seymour Hersh and Wayne Greenhaw broke the story and revealed that Calley had been charged with murdering 109 Vietnamese. Calley's trial started on November 17, 1970. It was the military prosecution's contention that Calley, in defiance of the rules of engagement, ordered his men to deliberately murder unarmed Vietnamese civilians even though his men were not under enemy fire at all. Testimony revealed that Calley had ordered the men of 1st Platoon, Company C, 1st Battalion, 20th Infantry of the 23rd Infantry Division to kill everyone in the village. In presenting the case, the two military prosecutors, Aubrey M. Daniel, III and John Partin, were hamstrung by the reluctance of many soldiers to testify against Calley. In addition president Richard M. Nixon made public statements prior to the trial that were prejudicial to the defense, resulting in a letter from Daniel taking the president to task. Some soldiers refused to answer questions point-blank on the witness stand by citing the Fifth Amendment right against self-incrimination. However, one holdout, a soldier in Calley's unit named Paul Meadlo, after being jailed for contempt of court by the presiding judge, Reid W. Kennedy, reluctantly agreed to testify. In his testimony, Meadlo described that, during the day's events, he was standing guard over a few dozen My Lai villagers when Lieutenant Calley approached him and ordered him to shoot all the civilians. When Meadlo balked at the orders, Calley backed off 40 feet (12 m) or more and opened fire on the people himself, and Meadlo joined in. Another witness named Dennis Conti, who was also reluctant to testify, described the carnage, claiming that Calley had started it and the rest of the 105 soldiers of Charlie Company followed suit. Another witness, named Leonard Gonzalez, told of seeing one of the soldiers of Calley's unit herd some men and women villagers together and order them to strip off their clothing. When the villagers refused, the enraged soldier fired a single round from his M-79 grenade launcher into the crowd, killing everyone. Calley's original defense, that the death of the villagers was the result of an accidental airstrike, was overcome by the few prosecution witnesses. In his new defense, Calley claimed he was following the orders of his immediate superior, Captain Ernest Medina. Whether this order was actually given is disputed; Medina was acquitted of all charges relating to the incident at a separate trial in August 1971. Taking the witness stand, Calley, under the direct examination by his civilian defense lawyer George W. Latimer, claimed that on the previous day, his commanding officer, Captain Medina, made it clear that his unit was to move into the village and that everyone was to be shot, saying that they all were Viet Cong. I was ordered to go in there and destroy the enemy. That was my job that day. That was the mission I was given. I did not sit down and think in terms of men, women, and children. They were all classified as the same, and that's the classification that we dealt with over there, just as the enemy. I felt then and I still do that I acted as I was directed, and I carried out the order that I was given and I do not feel wrong in doing so. After deliberating for 79 hours, the six-officer jury (five of whom had served in Vietnam) convicted him on March 29, 1971, of the premeditated murder of 22 Vietnamese civilians. On March 31, 1971, Calley was sentenced to life imprisonment and hard labor at Fort Leavenworth, which includes the United States Disciplinary Barracks, the Department of Defense's only maximum security prison. Calley was the only one of the 26 officers and soldiers initially charged for their part in the My Lai Massacre or the subsequent cover-up[clarification needed]. Many observers[who?] saw My Lai as a direct result of the military's attrition strategy with its emphasis on body counts and kill ratios. Many in the United States were outraged by Calley's sentence. Georgia's Governor, Jimmy Carter, future President of the United States instituted American Fighting Man's Day, and asked Georgians to drive for a week with their lights on. Indiana's Governor Edgar Whitcomb asked that all state flags be flown at half-staff for Calley, and the governors of Utah and Mississippi also publicly disagreed with the verdict. The legislatures of Arkansas, Kansas, Texas, New Jersey, and South Carolina requested clemency for Calley. Alabama's governor, George Wallace, visited Calley in the stockade and requested that President Richard Nixon pardon him. After the conviction, the White House received over 5,000 telegrams; the ratio was 100 to 1 in favor of leniency. In a telephone survey of the American public, 79 percent disagreed with the verdict, 81 percent believed that the life sentence Calley had received was too stern, and 69 percent believed Calley had been made a scapegoat. We intend to tell who it was that gave us those orders; that created that policy; that set that standard of war bordering on full and final genocide. We intend to demonstrate that My Lai was no unusual occurrence, other than, perhaps, the number of victims killed all in one place, all at one time, all by one platoon of us. We intend to show that the policies of Americal Division, which inevitably resulted in My Lai, were the policies of other Army and Marine divisions as well. We intend to show that war crimes in Vietnam did not start in March 1968, or in the village of Son My or with one Lieutenant William Calley. We intend to indict those really responsible for My Lai, for Vietnam, for attempted genocide. In a recollection of the Vietnam War, South Korean Vietnam Expeditionary Forces commanding officer Chae Myung Shin stated, "Calley tried to get revenge for the deaths of his troops. In a war, this is natural." Conversely, Colonel Harry G. Summers Jr. declared that Calley and Medina should have been hanged, drawn, and quartered, with their remains placed "at the gates of Fort Benning, at the Infantry School, as a reminder to those who pass under it of what an infantry officer ought to be." On April 1, 1971, only a day after Calley was sentenced in prison at Fort Leavenworth, President Richard Nixon ordered him transferred from Leavenworth prison to house arrest at Fort Benning, pending appeal. Calley served only three and a half years of house arrest in his quarters at Fort Benning. He petitioned the federal district court for habeas corpus on February 11, 1974, which was granted on September 25, 1974, along with his immediate release, by federal judge J. Robert Elliott. Judge Elliott determined that Calley's trial had been prejudiced by pre-trial publicity, denial of subpoenas of certain defense witnesses, refusal of the United States House of Representatives to release testimony taken in executive session of its My Lai investigation, and inadequate notice of the charges. The judge had released Calley on bail on February 27, 1974, but an appeals court reversed Elliott's ruling and returned Calley to U.S. Army custody on June 13, 1974. Consequently, his general court-martial conviction and dismissal from the U.S. Army were upheld; however, the prison sentence and subsequent parole obligations were commuted to time served, leaving Calley a free man. In 1975 Calley married Penny, with whom he has one son. The couple divorced in 2005 or 2006. He studied and became a gemologist, working at his father-in-law's jewelry store. There is not a day that goes by that I do not feel remorse for what happened that day in My Lai. I feel remorse for the Vietnamese who were killed, for their families, for the American soldiers involved and their families. I am very sorry ... If you are asking why I did not stand up to them when I was given the orders, I will have to say that I was a Second Lieutenant getting orders from my commander and I followed them—foolishly, I guess. Nuremberg Defense, the practice of pleading not guilty, by means of "following orders"
^ a b c "WSB-TV newsfilm clip of a reporter John Philp conducting street interviews with civilians and soldiers outside the commissary following the conviction of lieutenant William Calley for his role in the My Lai massacre during the Vietnam War, Fort Benning, Georgia". Civil Rights Digital Library. University System of Georgia. 1971-03-30. Retrieved 2009-08-22. Second lieutenant William Calley was a member of the Charlie Company, 1st battalion, 20th infantry regiment, 11th infantry brigade while in Vietnam. ^ Katz, Andrew. "Lieut. William Calley | Field of Dishonor: Famous American Court-Martials", TIME.com", August 17, 2013; accessed February 23, 2018. ^ a b "An Average American Boy?". Time. 1969-05-12. Retrieved 2007-01-15. ^ a b c Loh, Jules. "Average Guy Calley Found Niche in Army", Pacific Stars and Stripes, 12-01-1969. 25th Aviation Battalion, U.S. Army. ^ Tucker, Spencer (2011). The Encyclopedia of the Vietnam War: A Political, Social, and Military History. 1. ABC-CLIO. p. 149. ISBN 978-1-85109-960-3. Retrieved 2011-12-23. ^ Wilson, William. “I Had Prayed to God that this Thing Was Fiction...” Archived 2007-06-25 at the Wayback Machine, American Heritage, vol. 41 #1, February 1990. ^ "Daily Mail: The Monsterr of the My Lai Massacre – October 6, 2007". London, UK. October 6, 2007. Retrieved 2008-04-15. ^ Solis, Gary (1989). Marines And Military Law In Vietnam: Trial By Fire (PDF). History and Museums Division, United States Marine Corps. pp. 155–6. ISBN 9781494297602. This article incorporates text from this source, which is in the public domain. ^ a b Linder, Douglas. "JURIST – The My Lai Massacre Trial", JURIST – The My Lai Massacre Trial. March 2000. ^ "William Calley". Trial International. 8 May 2016. ^ "The Press: Miscue on the Massacre". Time.com. 1969-12-05. Retrieved 2013-08-30. ^ Oliver, Kendick (2006). 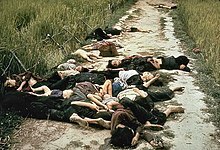 The My Lai massacre in American history and memory. Manchester UP. pp. 43–44. ISBN 978-0-7190-6891-1. ^ Kendrick, Oliver, "Coming to Terms with the Past: My Lai", History Today, 00182753, February 2006, Vol. 56, Issue 2. ^ 1946-, Olson, James Stuart,. Where the domino fell : America and Vietnam, 1945-2010. Roberts, Randy., Roberts, Randy, 1951- (Sixth ed.). Hoboken. ISBN 9781444350500. OCLC 859155073. ^ "1971: Year in Review: Calley Trial", Foreign Affairs via upi.com; accessed February 23, 2018. ^ a b c Frum, David (2000). How We Got Here: The 1970s. New York: Basic Books. pp. 84–85. ISBN 0-465-04195-7. ^ "Winter Soldier Investigation: Opening Statement of William Crandell". The 1960s Project. Institute for Advanced Technology in the Humanities at the University of Virginia. January 31, 1971. ^ "The Cold Warrior". Newsweek. April 10, 2000. Retrieved February 23, 2018. ^ David Anderson L., ed. (1998). Facing My Lai: Moving Beyond the Massacre. Lawrence, Kansas: University Press of Kansas. p. 126. ISBN 978-0-7006-0864-5. ^ "Calley Apologizes for Role in My Lai Massacre", UMsnbc.com, August 21, 2009. ^ "FOLLOW-UP ON THE NEWS; William Calley Jr.", New York Times", July 10, 1983; accessed August 9, 2017. ^ "Calley apologizes for role in My Lai massacre". msnbc.com. August 22, 2009. Retrieved April 8, 2017.